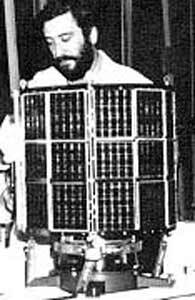 Intasat (Instituto Nacional de Tecnica Aerospacial Satélite), the first Spanish satellite was a small, magnetically oriented, spin stabilized spacecraft carrying a beacon experiment to study the ionosphere. The spacecraft was a 12-sided right prism, 44.2 cm across opposite corners, and 41 cm high. The beacon antennas extended along the spin axis for about 175 cm from the center of both ends of the satellite. Four 49 cm telemetry antennas extended diagonally outward from one end. The attitude control magnet with damping bars provided alignment to the local magnetic field vector within 2 weeks of launch. The 16 V power system was operated by 12 nickel-cadmium batteries charged by solar cells on the sides of the satellite. The orbit was sun-synchronous, with equator crossing initially occuring at noon and midnight local time. About 40 ground observers used the experiment for ionospheric study. INTASAT was launched piggyback with NOAA 4. Beacon power was turned on by a timer shortly after spacecraft separation from the launch vehicle. A killer-timer system turned off the spacecraft at the end of 2 years.